Where did our universe come from? Since the beginning of time, astronomers and physicists such as Galileo, Copernicus, and Einstein have dedicated their life’s work to this timeless question. Even today, investigating the universe’s origins remains hotly debated. To help answer this, the team at the Giant Magellan Telescope is building a 200 foot-high telescope that will help scientists uncover what has plagued scientists and science fiction enthusiasts alike: Are we alone? How did the first galaxies form? What is the fate of the universe? The GMT is uniquely poised to answer these questions due to its ability to collect more light than other telescopes and to its’ uniquely high resolution (which will be the highest ever achieved in a telescope). The project is sponsored by Astronomy Australia Limited, Carnegie Observatories, Harvard University, and other leading universities and research institutions from around the globe. 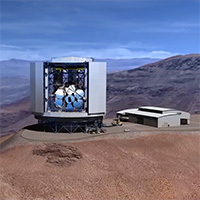 Due to the complexity of the structure, placement of mirrors, and movements that will occur during operation of the telescope, the engineering team at GMTO used MSC Software’s simulation tool, MSC Apex, to simplify and shorten their design and simulation workflow. MSC Apex’s dynamic components for design, specifically its importing utility and meshing features, were instrumental in the design and analysis of the GMT. The software was essential in helping to identify particular wind dynamics issues during the design process, which allowed developers to save time and increase productivity. MSC Apex became a critical tool in the GMT’s design process due to its easy user interface and customized meshing and simulation features. With the aid of MSC Apex, engineers at GMTO will be able to answer some of the toughest questions faced by mankind in a more streamlined, efficient way than ever before.